Clifton is a large area, starting at the gorge and Brunel's Suspension Bridge (aka Clifton Village) the area continues onto Whiteladies Road and Black Boy Hill. BCS is based just 2 minutes drive to Clifton and so we can offer businesses and home users an efficient and first rate service. BCS continues to support businesses on Whiteladies Road, Guthrie Road, Clifton Triangle, Gyles Sports on Black Boy Hill, Almavale Road, and Burlington Avenue to name but a few. References can be sought on demand. We also support management companies and houses in the area, specialising in setting up WiFi systems to cover the huge Victorian and Georgian buildings. 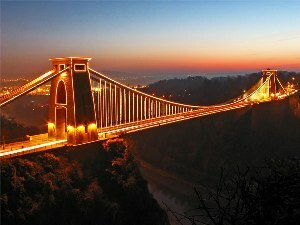 Pictured above is the iconic Brunel's Clifton Suspension Bridge, a symbol of Bristol and Clifton. Here is has been lit up, at sunset.